Stage 1 of the Amgen Tour of California saw an early breakaway of four riders get up to a six minute lead on the peloton. For Michael Morkov and all of Team Tinkoff Saxo, the main job was to keep the gap in check then bring it back before the finish to set up their team leader Peter Sagan. In the final 10 miles the pace ramped up significantly as the breakaway was finally reeled in and teams battled to control the sprint. Morkov put in a very big effort in the final miles, leading his team through the final finishing circuits. View Morkov’s full SRM file. At 4:45 into the ride, you can see a visible jump in Morkov’s effort as he works to lead out his team. His peak power values from 1 to 20 minutes are set during this time. Morkov’s peak 1 minute value was 515 watts (7.08 W/kg). Even during this relatively flat and easy stage, Morkov still burned 3025 calories. 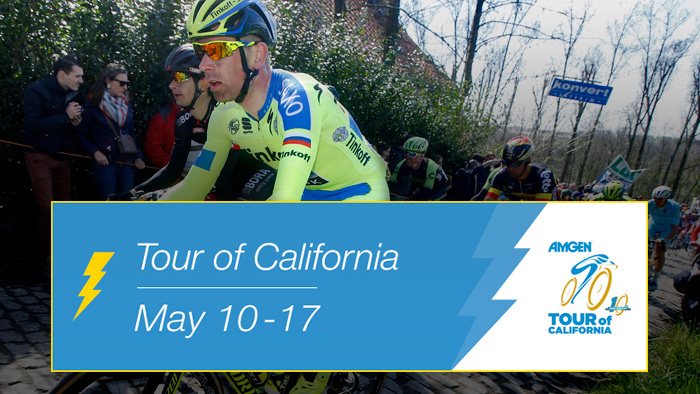 Stage 2 of the Tour of California was similar to the first stage. A stage for the sprinters, an early breakaway got a lead of up to five minutes before being swallowed up in the final circuits. Morkov worked as part of the Team Tinkoff Saxo lead out train, putting in some of the final pulls for teammate Peter Sagan. In the final 12 miles, Morkov again helps the Tinkoff Saxo sprint train stay at the front. He put out a Normalized Power of 305 watts over this distance and averaged 31 mph. Leading out Sagan in the final mile, Morkov puts out his Peak 1 Minute value of 536 watts. While considered a relatively easy day in the peloton, Morkov still had a Noramalized Power of 252 watts and averaged 24 mph over 120 miles. The climbing started right away. Less than 10 minutes in Morkov climbed for just under 11 minutes at a Normalized Power of 415 watts. His peak 1 Hour Power value of 304 watts was set in the first hour of racing. He also burned 1,093 calories. Over the full 106 miles Morkov had a Normalized Power of 297 watts. He also had an average cadence of 85 rpm. Pulling at the end for Sagan, Morkov put out 452 watts for 1:30 and averaged 33 mph. Over the full 107 miles, Morkov put out a Normalized Power of 274 watts. Morkov’s peak power value was 1206 watts. Unlike the previous stages, Morkov’s Peak Power values, from 12 minutes to 3 hours, occurred towards the end of the stage. Duing his Peak 20 minute power of 313 watts, he average 31 mph and 98 rpm. Leading out Sagan, Morkov averaged 645 watts for over 30 seconds. Over the short time trial, Morkov pushed 378 average watts. His average cadence was 100 rpm. Morkov paced this TT perfectly with a Variability Index of 1.0, meaning his effort was even. Morkov had to work hard the entire stage. His Peak 90 minute and lower values were all set during the first ascent up Glendora Ridge Road. His Peak 2 hour value was set while ascending Glendora Mountain Road to the top of Mt. Baldy. During this two hour period, Morkov put out 303 Normalized watts and burned 2031 calories while averaging only 15 mph. Over the entire stage, Morkov had a Normalized Power of 308 watts and burned exactly 4000 calories. Morkov went to work early in the stage, setting his Peak 2 MInute power of 421 watts (5.69 W/kg) just over 1 mile into the stage. His Peak 20 minute power of 333 watts was set 45 minutes later. Over the full stage, Morkov put out 320 Normalized watts.